The acclaimed eco-friendly chef, Tom Hunt, took some time out from his busy schedule to talk to us about his efforts to help the environment through responsible cooking, and to promote seasonal eating all year round. Tom Hunt is a renowned chef and food waste activist. He is author of The Natural Cook and founder of Poco restaurant, 2016’s Restaurant of the Year at the Food Made Good Awards. “Root to Fruit” eating is his mission - his aim is to reduce food waste by encouraging people to eat for pleasure and use produce in its entirety. Tom is also a champion for a number of food waste charities such as FareShare, FoodCycle, and Tristram Stuart’s Feedback. 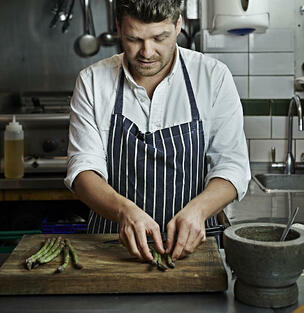 Tom Hunt has worked with well-known chefs like Hugh Fearnley-Whittingstall, and he collaborated with Dan Barber at his pop up restaurant wastED. He can cook up a feast with anything, from potato peels to fish skins. The sky's the limit. I always loved food. I had a really sweet tooth when I was a little boy, and cooking was a good way for me to access sugar. With the help of my grandmother I was already making baklava and chocolate brownies when I was eight years old. Later in life, when I was at university studying fine art, I really missed cooking. So I started cooking during the holidays with a chef called Ben Hodges. He cooks everything from scratch, and only uses high-quality organic ingredients. He later became my friend and mentor. His work has really inspired me and shaped my food philosophy. Within 6 months of starting at Aqua I had become the head chef. I was very lucky, and I ended up gaining a lot of my professional experience while I was managing the team. It all happened quite quickly, but naturally. How did you come up with your Root to Fruit concept? Is there any particular reason for giving it a vegetarian focus instead of using the popular term “from head-to-tail”? I created Root to Fruit eating as a reaction to the global food waste scandal. It was my way of promoting sustainable dining to the broader public. I chose this term because I’ve always been interesting in vegetable-focused cooking. It is probably because I am a seasonal chef, which means that I always look at what is in season before I start creating a new menu. There are seasonal types of meat, but not to the same extent as vegetables. As a result I naturally ended up focusing more on vegetables and fruits. Last year, Poco was chosen as the UK’s Most Sustainable Restaurant by the Food Made Good Awards (SRA). How important are issues like food waste and sustainable sourcing for Poco? It is the main priority of our business, as it should be for everyone I suppose. Bearing in mind our challenging environmental situation, I see it as a sensible reaction. This year SRA gave us a 93 out of 100 sustainability rating. So, of course, there is still room for improvement. To become even more sustainable we have been doing more local community work to help promote good food. We’re also looking into getting our own land so we can compost any waste we might have and grow our food with it. In addition, we are trying to only serve meat and fish that have some benefit to the environment. Sourcing invasive species of fish is a good example of how we can do that. It is very limited, and quite tricky, but we’ve been managing to serve signal crayfish - an invasive species that is killing some of our native species. What are the hospitality and foodservice trends that you are expecting to see in 2018? I believe the current drive towards environmental cuisine will continue, with more and more focus on vegetables and meat alternatives like the Impossible Burger. I also believe that seaweed will continue to increase in popularity. We are also going to see an increase in restaurants adding vegetarian options to their menus. You recently travelled to Palestine to open a pop-up restaurant. Tell us more about your experience - did you bring any interesting ingredients back with you? I went there with Fairtrade. I was interested in learning more about the products that they offer, and how they operate. I like supporting good farming, but sometimes it can be hard to understand how sustainable they actually are. So, supporting reliable international organisations like Fairtrade is a good way to improve sustainability on a global level. I had a wonderful time in Palestine, and I am currently using some of their local ingredients - almonds, for example. What is interesting about this is that Californian almonds are known for requiring a lot of water. Over a gallon of water, in fact. The indigenous almond trees that they grow in Palestine, on the other hand, only need to be watered a few times per season. They are far more environmentally friendly in that sense. And the fact that it is a Fairtrade-certified product also tells you that human rights and good working conditions are being assured. What’s are your plans for the future? I am looking to write a new book, and I am really excited about it. It will be a cookbook and a practical guide to sustainable eating. I am also working in consulting at the moment. I am currently helping a new hotel, a catering company and a retail brand become more sustainable. I’ve been cooking less and focusing more on different areas that I haven’t had a chance to explore much in the past. How can chefs cook with seasonal ingredients during the winter months? It is so easy for chefs to cook with seasonal products all through the year. Although it is winter, there is a vast variety of British seasonal vegetables available. Far more than most people expect. Actually, I believe that eating a seasonal diet, even during the winter, leads to more diversity within the diet because it leads to people exploring different species and varieties. These are normally easier to find in small local farms rather than large supermarket chains. Can you tell us a simple recipe that can help chefs reuse leftover ingredients from their Christmas dinner? Sure. Beetroots are great products because you can use the entire vegetable, including the leaves. Actually, beetroot leaves make a delicious vegan dip for Christmas. All you need to do is wilt them with lemon zest and garlic, mix with soya-yoghurt and then top with crushed nuts and a sprinkle of za'atar or spice. Simple, healthy, sustainable, and delicious. What recommendations would you give to chefs who are looking to reduce their food waste in order to run a more sustainable kitchen? Cook from Room to Fruit. Challenge yourself to use the entire ingredient. Most of the time there is no need to peel vegetables and fruit, and a lot of the nutrients are present in the skin. It is also important to keep a record of your waste and understand where it is coming from. By doing this, you’ll be able to look for ways to reduce it. Creating rescue recipes is also an efficient and delicious way to reduce your food waste.